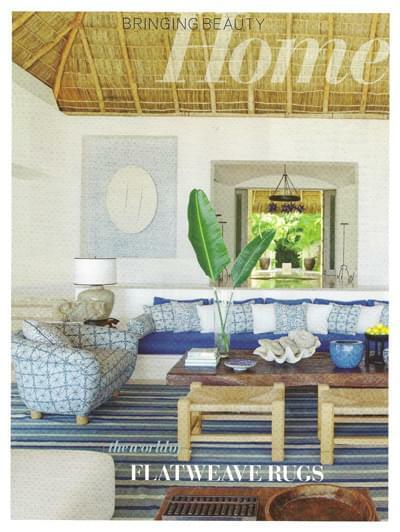 Check out the new July/August issue of Veranda, which features an editorial called the "The World of Flatweave Rugs, a guide to our favorite finds". The article includes Matt Camron's beautiful flatweaves! These pieces are part of our flatweave collection which is designed by and exclusively made for Matt Camron. The collection is large and includes Moroccan, Mid-Century Swedish and Navajo designs as well as trendy geometrics like Ikat, Chevrons and trellis patterns. Our collection is also available in custom sizes, designs, and colors!! Decorator Bunny Williams uses wide stripes to bring casual warmth to her Dominican Republic living room. Here's a piece from our Flatweave Navajo collection. This rug was also features in Interiors Magazine this month! This piece is from our Flatweave Moroccan collection. Last but not least, this one is from our Flatweave Mid-Century Swedish collection.